Low frame count just to test the repaired EQ45 Mount, and PHD....everything went well. 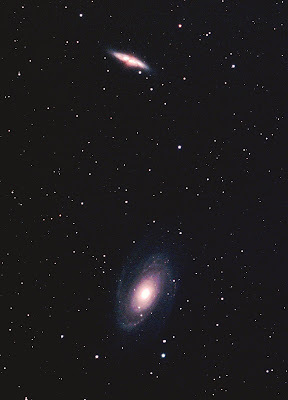 Messier 81 is the largest galaxy in the M81 Group, a group of 34 galaxies located in the constellation Ursa Major. At approximately 11.7 Mly (3.6 Mpc) from the Earth, it makes this group and the Local Group, containing the Milky Way, relative neighbours in the Virgo Supercluster.